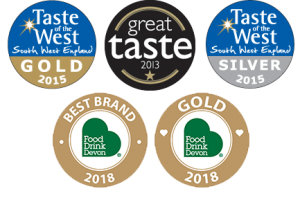 At Otter Vale, we’re always keen for an excuse to get out and visit people, including suppliers and customers who are as passionate about food and provenance as we are. Here in Devon we’re a little bit spoilt to have so many great farm shops, both large and small, on our doorstep. 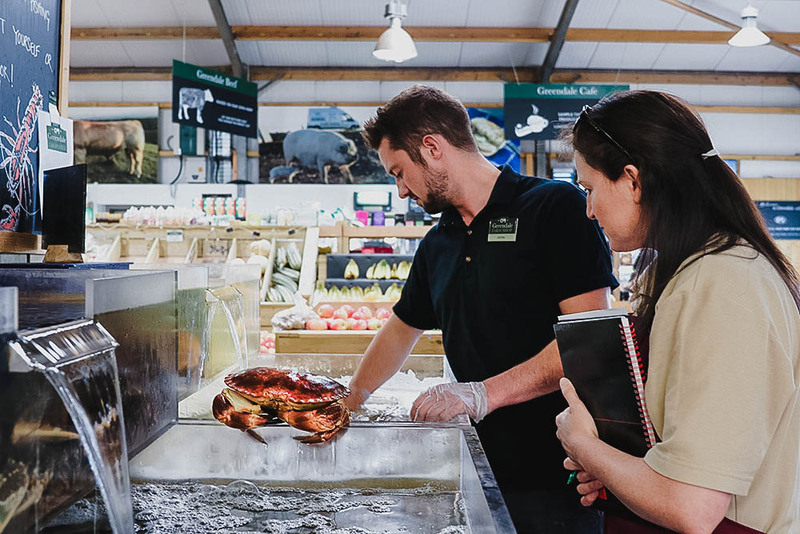 So, what better place to start our brand new ‘You Otter Know’ blog series, than by visiting one of the largest fishmongers in the South West: Greendale Farm Shop. 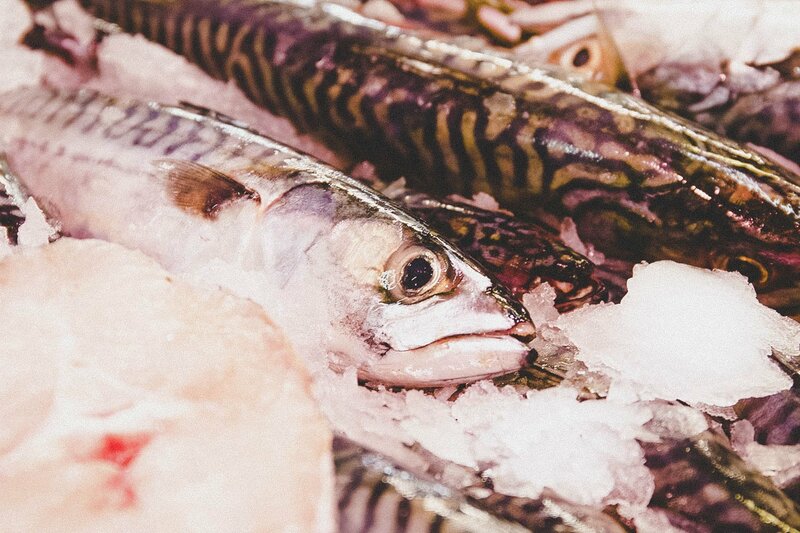 Our first instalment of ‘You Otter Know’ focuses on mackerel as a seasonal and sustainable fish. We interviewed the very sporting – and very natural – James England, Head of Fishmongery at Greendale. 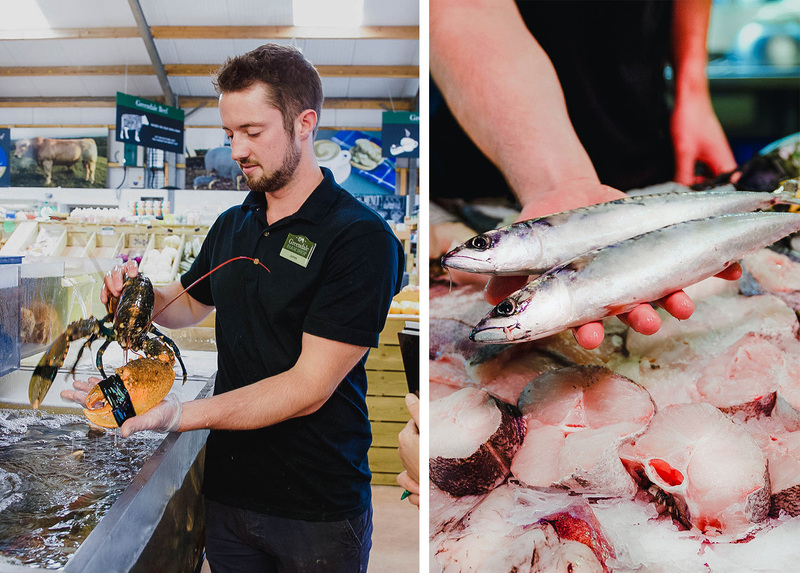 James told us everything we need to know about the Greendale fleet and sustainable fishing, as well as demonstrating how to prepare mackerel at home..
How long have you worked at Greendale Farm Shop? About eight years. Initially, I was based at Ladram and I’ve been onsite here for six years. During that time I’ve been a fishmonger, and also spent two years in the shop, including one year as Store Supervisor. How long has there been a fishmongers at Greendale? How many people work on the fish counter? We have five fishmongers and three members of staff on the fish & chips counter. What’s most popular on the actual fish counter? It’s got to be Greendale caught Cornish MSC Certified hake, a soft and delicate white fish. What do you sell and make on the fish counter? We sell quality local fresh wet fish, shellfish and seafood produce with much sourced as locally as possible. Most comes from our own boats (we’ve got more detail on this below) and from carefully selected suppliers. Tell us more about Greendale’s fleet. What do they fish for and where? We currently have 15 boats, including potters, scallopers, netters, and beamers. They work from the Welsh coastline all the way to Dover. Most of the fleet bear the name ‘…. of Ladram’ e.g. Margaret of Ladram, Joy of Ladram, Sam of Ladram, Karen of Ladram; named after female members of the family. William is the exception, being named after the founder of Greendale, William FWS Carter. 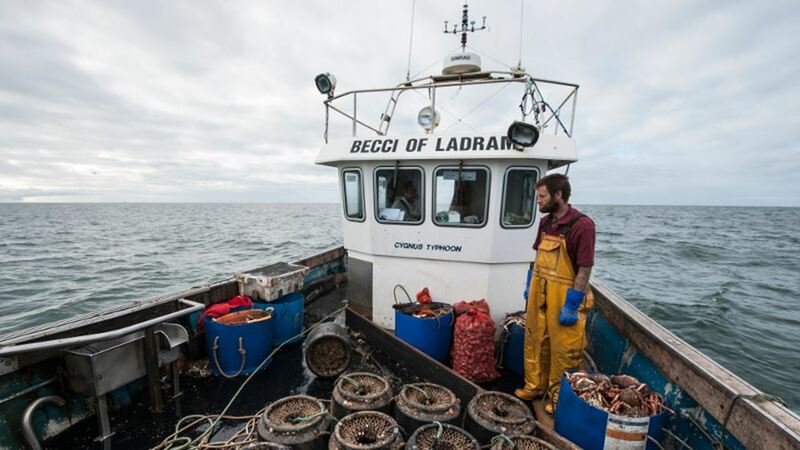 The Becci of Ladram always lands in Exmouth; she brings home local crabs, lobsters, whelk and scallops. Our oysters come from Teignmouth when in season; France if not. Our mussels come from Exmouth and whelks, scallops are landed in Exmouth and Weymouth. Some shellfish come from warm water areas, so by necessity these tend not to be local, such as crayfish tails, prawns, brown shrimp, and sometimes razor clams. Our beamers bring home mostly flat fish, landing in Brixham; and our megrim sole is landed in Newlyn. The netters mostly catch monkfish, whiting, cod and pollock, landing in Brixham; with hake and other white fish being landed at Newlyn. We source our salmon from the world-renowned Loch Duart in Scotland. Where does Greendale get their mackerel from? Our local mackerel is landed at Brixham, caught using the method of rod & line. We prefer this, as the quality of the fish does tend to be better. Fish landed from our boats is in the shop being sold to customers that very same day – it doesn’t get much fresher than that. How important is sustainability to the fleet, Greendale and the local fishing community? Sustainability is essential to us all. Our fleet follow the Seafood Responsible Fishing Scheme. Our Cornish hake is MSC certified; and we don’t do discards (meaning they don’t throw fish back overboard). We also fish for litter, pulling rubbish out of the sea – especially plastic! Can you suggest any possible reasons why mackerel have been slow coming in/in low numbers this season? How do you recommend storing mackerel if your customer can’t eat it fresh? Preferably, eat this oily fish as fresh as possible. It can even be eaten raw on the first day if you like; but it will last 2 – 3 days at 3-4˚C. Freeze at home if needs be – as soon as possible after buying or catching – but make sure you gut it first before storing (see video below). Do you have any favourite mackerel recipes? There are many ways to eat mackerel; barbecued whole or as fillets, pan fried fillets, oven roasted whole, hot smoked and eaten for breakfast, or turned into a beautiful smoked mackerel pâté (which we make and sell in store). I prefer to keep it nice and simple, as mackerel has a strongish flavour so no point in hiding that flavour with other tastes. So for me, it’s pan fried. 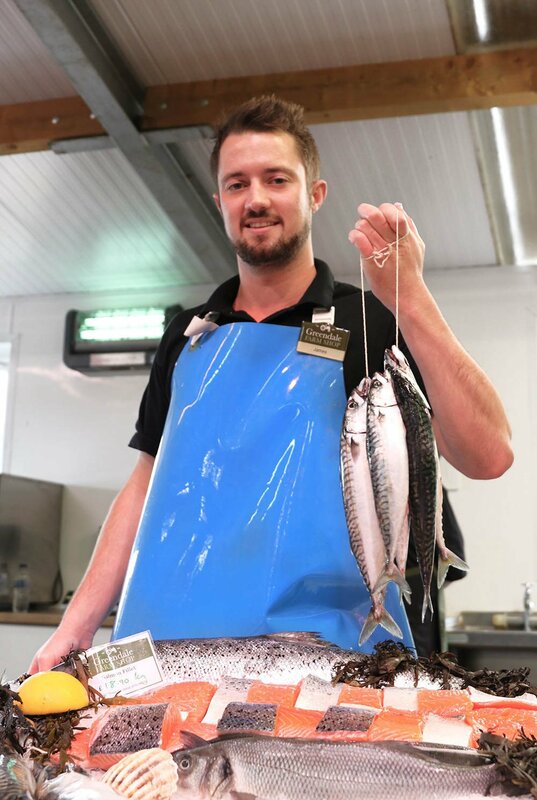 What ingredients would you recommend using from the farm shop to cook up with your mackerel? We have lots of local seasonal fresh veggies from the store, and of course, it pairs beautifully with Otter Vale Gooseberry & Elderflower Chutney, which we stock in the shop too. Photos and Video by Gaby Dyson. Words by Andrea Laxon.